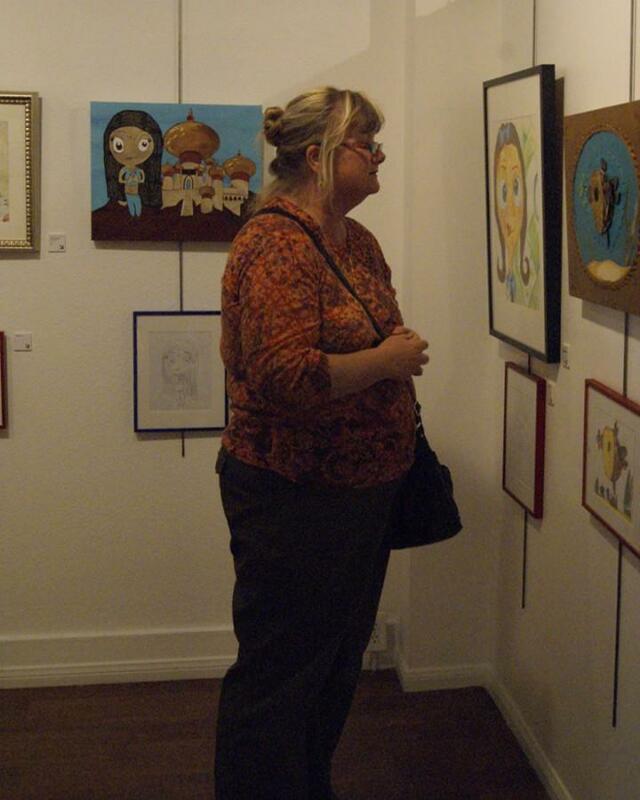 Linda Brown, a local high school teacher, looks at the “Fishy” drawing at The Foundry. Every March The Foundry celebrates the creativity and imagination of children with their Art Imitates Art exhibit. In the exhibit, which is in its second year, The Foundry asks children to send in their drawing of their pets, like fish and turtles, their families, or whatever the children wants to draw, then an artist is assigned to reinterpret the drawing. They paint and sculpt using the shapes and colors of a child’s imagination as inspiration. The show opened March 1 as a part of First Friday. Jorge Guillen has participated in the show for the last two years it has been held. He explained the process that he went through working off a child’s piece. Guillen enjoyed the process of the Art Imitates Art exhibit. “I like it because there’s elements of a bunch of different art styles. It’s a really good experience,” he said. Debbie Korhonen, an artist in the show, had three of her kids contribute to the show. Ethan, age 8, was a bit more articulate. He said that he painted “a turtle in a cage” because they have a pet turtle at home. He liked how Teri Webb, the artist who did his piece, made the eyes of his turtle “kind of the same” and “stick out like 3D.” Webb’s piece used nuts and bolt glued to a painting to create that effect. Briel, age 6, described her piece as “fish, and turtle, in the ocean.” Similar to Luke she drew those things because he liked them. Korhonen enjoyed watching her children spread their wings. “It’s a great opportunity. People have been wanting to shake their hands and that’s sweet,” she said. According to Christina Sweet, a co-owner and executive director of The Foundry, the show is popular every year and this year was no exception. “[The show is going] wonderful. It’s twice as big. The crowd has been pouring in all night long. Sales are great. Kids have been coming in sipping sparkling cider. It’s definitely been a great success,” she said. Sweet thinks this comes from the show being a family outing. For Sweet, who herself participated in the show, one of the goals of the show is to challenge the adult artists. “I like the challenge it poses. To use the exact shapes that the children uses and to create something or embellish on it,” she said. Sweet explained how she addressed that challenge when she interpreted a piece by a 3 year old that drew her family. Sweet’s top goal and favorite part of the Art Imitates Art shows is how it encourages children to continue their artistic impulses.